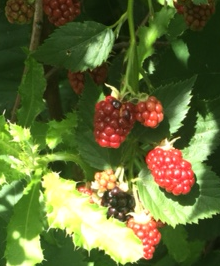 While the hot and dry weather has been challenging to work around, our dedicated volunteers have been regularly weeding and watering to keep the garden going, and their hard work has resulted in a great harvest year so far. Let’s not forget the work also done by our insect visitors such as bees and butterflies who are loving the wildflowers and flowering bushes. Pat on the back to the unseen earthworms as well as the birds who keep the insect population under control. Here’s a quick update on what we have already harvested, what is currently being picked, and what’s coming up on the sales table. We sell our produce Wednesday evenings and Saturday mornings. Chemical-free, as local as it gets, and extremely reasonable prices. Sales proceeds go towards our supplies for the following season, with surplus being donated to local charities such as the food bank. 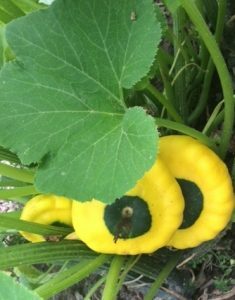 Yellow squash and patty pan squash – so many to choose from and so delicious! Zucchini are just starting to become available. These fruits and vegetables are starting to ripen and should be available for sale later in the season. Also keep an eye on the giant sunflowers, which are just starting to open up. Check back in September for an update on potatoes and Jerusalem artichokes. Hopefully you were lucky enough to enjoy the rasberries, gooseberries, strawberries, asparagus, lettuce, radishes, garlic and bok choy that we have already harvested and which we will see again next spring and summer.